Sen. John McCain, R-Ariz., speaks to reporters on Capitol Hill in Washington last July. The Mayo Clinic announced that same month that he had been diagnosed with brain cancer. "In the year since, John has surpassed expectations for his survival," his family said in a statement. "But the progress of disease and the inexorable advance of age render their verdict. With his usual strength of will, he has now chosen to discontinue medical treatment. "Our family is immensely grateful for the support and kindness of all his caregivers over the last year, and for the continuing outpouring of concern and affection from John's many friends and associates, and the many thousands of people who are keeping him in their prayers." His daughter, Meghan McCain, tweeted that her family was "deeply appreciative of all the love and generosity you have shown us during this past year. ... We could not have made it this far without you — you've given us strength to carry on." In July 2017, McCain had surgery in Phoenix to remove a blood clot from above his left eye. 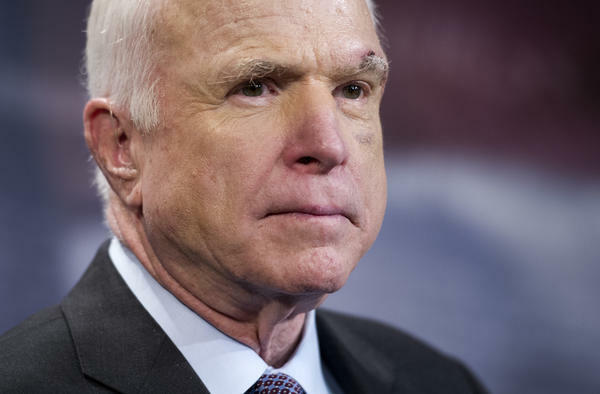 The Mayo Clinic announced that tissue analysis revealed McCain had a glioblastoma. McCain returned to Washington, D.C., later that month to cast a deciding vote against a Republican push to repeal the Affordable Care Act. He called on lawmakers to "return to the correct way of legislating and send the bill back to committee, hold hearings, receive input from both sides of aisle, heed the recommendations of nation's governors, and produce a bill that finally delivers affordable health care for the American people." President Trump was critical of McCain's vote, tweeting that the senator was among those who "let the American people down." As he continued his work in the Senate last fall, McCain underwent rounds of chemotherapy and radiation at the National Institutes of Health in Bethesda, Md. The senator has been absent from Washington since December, when he went home to Arizona for treatment of a viral infection. In recent months, he has been receiving visitors including former Vice President Joe Biden, Sen. Lindsey Graham and retired Sen. Joe Lieberman. Republicans have shied from discussing the future of McCain's seat in the Senate. McCain has been in the U.S. Senate for more than 30 years and served nearly as long in the Navy. During the Vietnam War, he was shot down and captured, spending more than five years in the infamous "Hanoi Hilton" prison. He twice ran for president, and in 2008, he was his party's nominee, going on to lose to Barack Obama. "It's been quite a ride," McCain writes in his memoir The Restless Wave, published in May. "I made a small place for myself in the story of America and the history of my times."